Christians will remain the largest religious group in the world until 2050 according to a new demographic study by the Pew Research Centre, a research organisation that informs the public of attitudes and trends shaping America and the world. However, Muslims are the fastest growing religious group and those with no religion are shrinking as a share of the world’s population. In 2010, Christianity was by far the largest religion on the planet with 2.2 billion followers, with Islam in second place with 1.6 billion adherents. But Pew predicts that by 2050 Islam will nearly have caught up with Christianity, with 2.76bn to 2.92bn followers respectively. If the trend continues past 2070, Pew says that Muslims may overtake Christians, but that is beyond their main predictions. Atheists, agnostics and other groups that do not have a religion will decline as a percentage of the world’s population – although increasing in absolute numbers in places like the US and France. 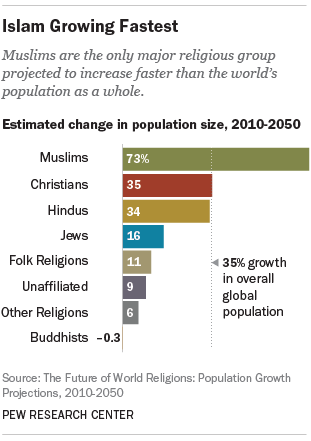 Hindus are predicted to increase slightly while the percentage of Buddhists will remain static. Some of the predicted changes in nations or regions are surprising. India will overtake Indonesia as the nation with the largest Muslim population (but will still have a Hindu majority). In 2050 Europe will have a population that is 10% Muslim, confounding some “Eurostan” style arguments. In 2050 four out of every ten Christians will live in Sub-Saharan Africa. These predictions are based on demographic projections by the Pew Research Centre. They are based on factors like fertility rates, infant mortality, migration, and the age of populations. They do not take into account such things as war, famine, and religious revivals. Globally, Muslims have the highest fertility rate, an average of 3.1 children per woman, and Christians are second, at 2.7 children per woman. Buddhists and those of no religions have low fertility rates. The age distribution of Muslims and Hindus set these groups up for growth. Christians fit the global average for age distribution, while the larger youth populations amongst Muslims is a key factor in Pew determining they will grow faster. 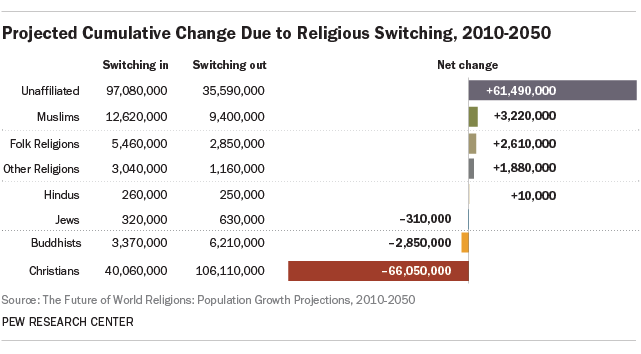 Perhaps the most controversial prediction is that Christians will suffer the highest net losses from people switching religion – a net loss of 60 million in the years to 2050. This mirrors a net gain for those who claim no religion. Migration, says the Pew team is the hardest factor to predict. Their prediction for the Middle East is the most interesting: the exodus of Christians from some countries in the region will be offset by the continued migration of Christians into the Gulf States (Bahrain, Kuwait, Oman, Qatar, Saudi Arabia and the United Arab Emirates). The main prediction by Pew is that strong growth of both Christians and Muslims centres on Africa. There, strong growth depends on strong population growth for both groups. The predicted decline of those affiliated to no religion is based on the population trends, fuelled by low fertility and aging populations in Japan, Europe and North America.